Status: Tentatively observed – a boson "consistent with" the Higgs boson has been observed, but as of July 2012, scientists have not conclusively identified it as the Higgs boson. The Higgs boson or Higgs particle is a proposed elementary particle in the Standard Model of particle physics. The Higgs boson is named after Peter Higgs who, along with others, proposed the mechanism that suggested such a particle in 1964. The existence of the Higgs boson and the associated Higgs field would be the simplest known method to explain why certain other elementary particles in the standard model have their mass. In this theory, an unseen field permeates space; this field has a non-zero value everywhere, even in its lowest energy state, and various other elementary particles obtain mass by interacting with this field. The Higgs boson—the smallest possible excitation of this field—is predicted to exist by the same theory, and has been the target of a long search in particle physics. One of the primary design goals of the Large Hadron Collider ("LHC") at CERN in Geneva, Switzerland—one of the most complicated scientific instruments ever built—was to test the existence of the Higgs boson and measure its properties, which would allow physicists to confirm this cornerstone of modern theory. 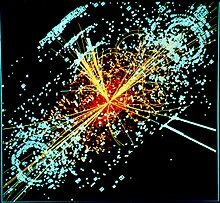 Because of its role in a fundamental property of elementary particles, the Higgs boson has been referred to as the "God particle" in popular culture, although virtually all scientists regard this as a hyperbole. According to the Standard Model, the Higgs particle is a boson, a type of particle that allows multiple identical particles to exist in the same place in the same quantum state. Furthermore, the model posits that the particle has no intrinsic spin, no electric charge, and no colour charge. It is also very unstable, decaying almost immediately after its creation. If the Higgs boson were shown not to exist, other "Higgsless" models would be considered. By 2011 a number of these experiments had gradually and consistently highlighted a range of energies around 125 GeV (a unit of mass for particles). On 4 July 2012, the CMS and the ATLAS experimental teams at the Large Hadron Collider independently announced that they confirmed the formal discovery of a previously unknown boson of mass between 125–127 GeV, whose behaviour so far was "consistent with" a Higgs boson, noting that further data and analysis were needed before positively identifying the particle beyond doubt. ↑ Higgs, Peter (1964). "Broken Symmetries and the Masses of Gauge Bosons". Physical Review Letters 13 (16): 508–509. Bibcode 1964PhRvL..13..508H. doi:10.1103/PhysRevLett.13.508. http://prl.aps.org/abstract/PRL/v13/i16/p508_1. ↑ Englert, François; Brout, Robert (1964). "Broken Symmetry and the Mass of Gauge Vector Mesons". Physical Review Letters 13 (9): 321–23. Bibcode 1964PhRvL..13..321E. doi:10.1103/PhysRevLett.13.321. ↑ Guralnik, Gerald; Hagen, C. R.; Kibble, T. W. B. (1964). "Global Conservation Laws and Massless Particles". Physical Review Letters 13 (20): 585–587. Bibcode 1964PhRvL..13..585G. doi:10.1103/PhysRevLett.13.585. Àtunṣe ojúewé yi gbẹ̀yìn wáyé ni ọjọ́ 27 Oṣù Kẹrin 2013, ni ago 11:53.